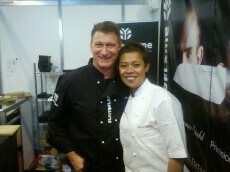 Chef Monica Galetti – Brand Ambassador, and a huge Flint & Flame fan. Well known judge on BBC’s Masterchef and former Sous Chef to Michele Roux at Two Michelin starred Le Gavroche restaurant in London. Chef Mike Robinson – Huge fan of Flint & Flame and Rhineland Knives, TV personality, famous Chef, cook, forager and author. Designed Robinson Hunting ‘Hunter’s Edge’ deer knife in conjunction with Flint & Flame. Owner of the exquisite Gastro pub The Pot Kiln in Berkshire and the only Michelin Starred Gastro Pub in London, the Harwood Arms in Fulham. 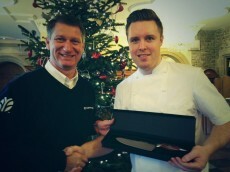 Chef Steven Edwards – Official brand ambassador, Masterchef Champion 2013. Chef Jean-Christophe Novelli – a Michelin and 5AA Rosette award winning French Chef, whose attributes include AA Chef’s Chef of the Year, European Chef of the Year Finalist and the prestigious Egon Ronay Dessert of the Year. Mike Robinson – Fan of Flint & Flame, TV personality, famous Chef, cook, forager and author. 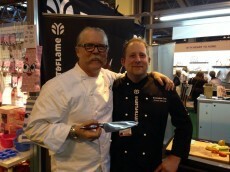 Public endorser of our knives at Grand Designs and other events across the UK. Also brand ambassador for De Dietrich Kitchen appliances. Owner of the exquisite Gastro pub The Pot Kiln in Berkshire. John Quilter – TV personality, urban Chef and famous ‘Buskin Chef’. Active as a web broadcaster and works closely with Jamie Oliver. Mark Lloyd – TV personality, famous Chef, cook, forager and host of Ideal Home Show, Chefs stage and other chef stages around the UK. Chef Martin Blunos – two time Michelin star chef, owner of Blunos Restaurants in Bath and Newcastle. Probably the first celebrity Chef in the UK. Kitchen royalty and a totally nice man. Chef Ken Hom OBE – Internationally recognised Chef – who doesn’t have a Ken Hom wok? Ken loved seeing, using and acquiring our knives at 2014 Spring Fair UK. 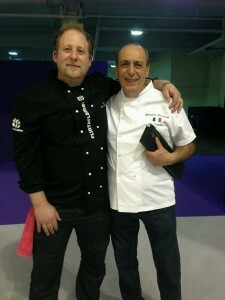 Chef Gennaro Contaldo – Very well-known and respected Italian Chef. Chefs Jenny Morris & Reza Mahammad – Internationally recognised chefs and stars of Food Network TV. Chef Chris Lester – Executive chef of Caprice Group including the Ivy Restaurants & Rivington Grill restaurants worldwide. Chef Jason Lee Pettit – Executive Chef Noodle House Restaurant, flagship rest of the Jumeriah Group. Finest Asian fusion restaurant in Dubai. Chef Gareth Drew – Executive Chef at Bin Hendi Restaurant Dubai one of Dubai’s finest fine dining restaurants. Andrew Dickens – TV personality and actor and stag host at numerous food festivals worldwide. Accomplished home cook with a love of quality. 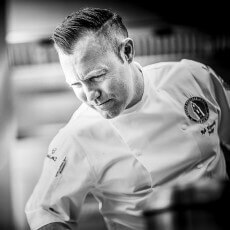 Chef Rob Kennedy – Executive Chef at The Royal Military Academy, Sandhurst. Rob manages menus for Royal Family visits, Senior Dignitaries and World Leaders and has over 75 Culinary Awards and 20 Gold Medals to his name.